Many schools named for PMs – now what? The majority of Canadian Prime Ministers have had schools named after them, but as some Canadians revise their assessment of our leaders through the prism of today’s mores, expect the clamour to expunge the names to continue. That’s because all of our leaders have a dark side. They did things in their day that they believed (and were seen by most of society at the time) to be the ‘right thing’. Macdonald has lots of schools named after him; Laurier has a university; Abbott has a college. A few have had schools named after them that have since closed (Bowell and Bennett). Clark is the only living former PM with a school bearing his name, although Mulroney has a university institute named after him in the Maritimes. Young Joe Clark, a speechwriter for Conservative leader Robert Stanfield had been dating Catriona Gibson for four years, even though he was in Ottawa and she was studying law in Toronto. One of their rendezvous, in fall 1969, was in Huntsville, Ontario. On the return to Toronto, Gibson was killed in a car accident. It was two days before Clark heard the news. 1964: Having lost last year’s election to the Liberals, former prime minister John Diefenbaker wins a leadership review vote in Ottawa. The president of the Progressive Conservative Student Federation, Joe Clark, introduces the Chief at the annual meeting. How many PMs have received the Order of Canada? Since the creation of the Order of Canada on July 1, 1967, only two former Prime Ministers have not received it. 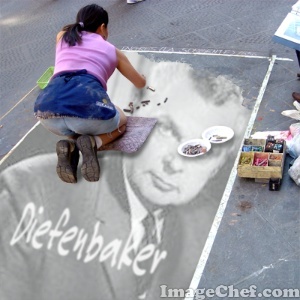 John Diefenbaker was still an MP at the time of his death in 1979; sitting politicians are ineligible for the honour. Paul Martin stepped down as an MP in 2008; presumably he’ll receive the recognition in the next few years. His father was made a Companion of the Order in 1976. For the record, PM Companions have been Louis St. Laurent, Lester Pearson, Pierre Trudeau, Joe Clark, John Turner, Brian Mulroney, Kim Campbell and Jean Chretien. Interesting side note: Elizabeth May, leader of the Green Party and a sitting politician, belongs to the Order. She received the honour before entering politics.